2 of 5 In a large nonstick skillet, heat oil over medium-high heat. Add chicken and cook 6 minutes, until lightly browned. Cook in 2 batches, if necessary. 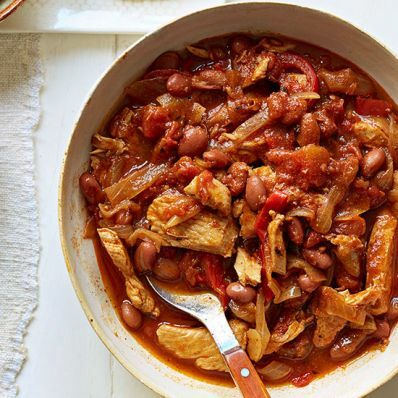 3 of 5 In slow cooker bowl, layer onions, peppers, cooked chicken and beans. Combine tomatoes, chili powder, cumin, oregano and salt. Pour over beans. 4 of 5 Cover and cook on HIGH for 3 hours or LOW for 6 hours. 5 of 5 Serve with shredded cheddar, sour cream, guacamole and flour tortillas, if using. Per Serving: 8 g Fat, total, 8 g fiber, 24 g carb., 2 g sat. fat, 104 mg chol., 920 mg sodium, 44 g pro., 353 kcal cal.